Bill W.'s Grapevine Writings - Softcover, 436 pages - Author: Bill W.
In 1935, two drunks met and talked in the library of a home in Akron, Ohio, and from that single event was to grow a program of recovery for more than a million once-hopeless alcoholics. How did the seed that became Alcoholics Anonymous take root and develop? The articles in this book tell much of that story. In the Grapevine, AA's international journal, co-founder Bill W. recorded--and reflected on--AA's history as it happened. A prolific writer, Bill authored more than 150 Grapevine articles, from 1944 to the late 1960's and virtually all of them appear here, published for the first time in one volume. A man of extraordinary energy and action, Bill committed his thoughts to paper with great facility. Yet the lessons of which he writes were born of a long and arduous process of trial and error, and in the events and insights he chronicled from AA's pioneer years, sober alcoholics can find their own struggles and those of their groups today. Covering a multitude of topics, from the basic principles of AA's Steps and Traditions to a discussion of the personal search of many AA members for "emotional sobriety," Bill's words hold meaning for AA members of any age. Writing ten years after his first visit to European AA with his wife Lois in 1950, Bill had this to say: "As we journeyed from land to land, we had the same magnificent adventure in kinship over and over...Everywhere, everywhere, it was the same...the communication of heart to heart in wonder, in joy, and in everlasting gratitude. Lois and I knew then that AA could circle the globe--and it has." 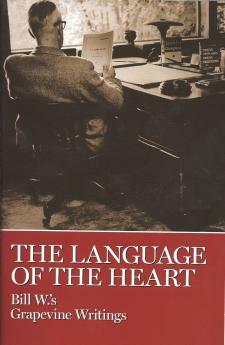 It is the belief of the Grapevine editors that the fundamental AA experience expressed here will illuminate every facet of AA life--a way of life that has, over the years, helped one suffering alcoholic to communicate with another in "the language of the heart."